I attended a Professional Development session at my school today. There were about 16-20 staff members present (there is another Professional Development session tomorrow which the others will likely attend). Part of the professional development session, which is planned by teachers, focused on Math curriculum and how it is aligned and sequenced with respect to the grades below and the grades above. Being new to the school, I did a lot of listening, but did ask a few questions here and there. There was some interesting discussions focusing on curriculum and what each grade level focuses most on with their students. There was also a great deal of discussion about which curriculum used to be included in the math curriculum for each grade and which prescribed learning outcomes were changed when the math curriculum was redone in 2007 and, thus, not expected to be taught by teachers any longer. One of the areas that was discussed was “Telling Time”. Many of the teachers talked about the fact that many of their students do not know how to tell time on an analog clock. Time and passage of time used to be a focus in the curriculum for students as young as Kindergarten/Grade 1, but was taken out of the British Columbia math curriculum in 2007 (for every grade except for Grades 3 & 4). Teaching students how to tell time on digital and analog clocks is only in the Grade 4 math curriculum. As I listened to these passionate, dedicated teachers discussing this issue, I wondered silently if the skill of being able to tell time on an analog clock was even necessary at all. Don’t get me wrong – time: understanding time, understanding passage of time, understanding the units time is measured and what each unit of measure means, and relating all of this to their everyday life, is very important. My question is with learning to tell time on analog clocks. How many young people wear analog watches (or any watch, for that matter) or have an analog clock in their house? 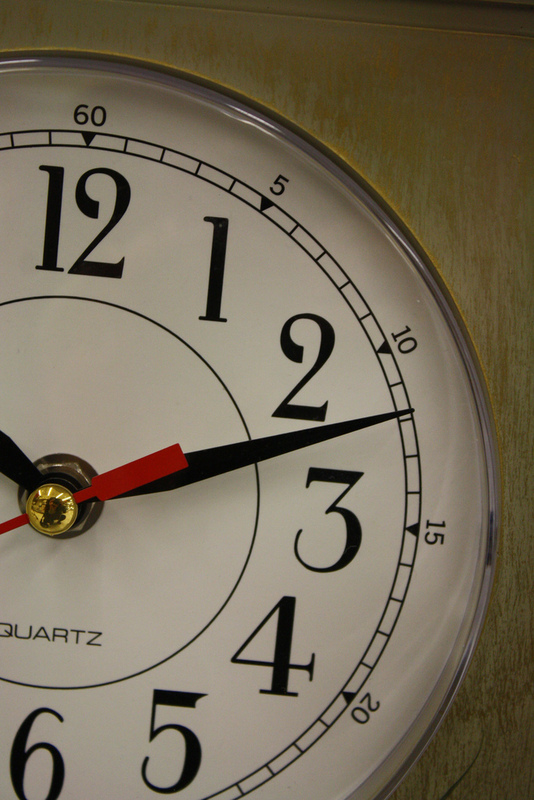 How many businesses display the time using analog clocks? How often do people refer to analog clocks in conversations? Is it really necessary for 21st Century students to learn how to tell time on an analog clock in today’s digital age? I would argue that there are many other math concepts that are much more important to teach our students in order for them to be numerate members of our society. This entry was posted in Curriculum, Reflection and tagged analog, curriculum, math, time. Bookmark the permalink. I agree that there must be more relevant topics for our children to be taught in school. However, I feel strongly that my son should be able to tell time using an analogue clock. I’ve been teaching him how to tell time since he was a very little child. Perhaps I’m in denial about all things digital, but there are a few outdated, or currently unpopular, skills I’d like him to have. Another outdated skill I will be teaching him is to be able to write cursive. Am I disheartened or sad that these skills may not be taught in schools? Not at all. If anything, it will give me the opportunity to share with him something special, not quite mainstream anymore, maybe even a little odd. Give teachers the power and tools to inspire our children and give them the knowledge and skills to carry them into the future, let’s not focus on irrelevant topics of the past. We have some teachers that use the analog clocks (which we still have in every classroom) for multiples of 5 and fractions. If we honestly look at analog you can question it’s necessity but using it as a relevant tool for math operations (as well as time) can be very powerful. There are many types of learners out there – including visual learners/thinkers. I believe they may need the analog clock to have a good understanding of time. Kids with autism spectrum disorders are an example. Anyone who has good reason to, I don’t think I have ever seen a business person without one when they are busily rushing around the city. Anyone who works out of an office and an easily breakable phone is dangerous (farmers, field and lab scientists, engineers, artists, horticulturists, builders, etc.) Even teachers when they need to take the children outside on excursions I would hope. Also anyone who needs to wear a watch with any type of fashion sense or wants to look slightly professional needs it to be analog. Ever seen a beautiful digital watch? I have to say I have seen one amazing designer brand that is digital, but it does not use numbers it uses a range of patterns which in most cases needs knowledge of an analog clock to read. A lot. A very famous one.. How many people have been to businesses of any type that have had a wall of different clocks in different time zones (I once even had a dentist do it). Very rarely are those clocks in digital. Want your child to eventually attend High School and University? Every class room has an analog clock. In exams an analog clock is place in front of everyone and you are even told to wear a watch incase you are seated too far from the clock or at a bad angle. You are not allowed to bring a phone into exams to check the time. Personally, Doing a field science degree myself, In a lab you are surrounded by analog and digital clocks. Depending on the instruments used. And if you think that during some practicals (whether in a chemistry lab or constraining an animal) that you have time to pull out a phone to check the time, no that can be highly dangerous. You do a quick glance at your watch. When ever someone needs to know the time. I found this page because I noticed a growing number of people my age (lower 20s) unable to read clocks and the problems, that they personally tell me, during work and study. If children are not to learn analog reading at school then either parents will need to teach them or they may have to learn to do it themselves. Because there is still quite a need for it. Also I learnt to read time and all other maths concepts followed and I personally think reading time helped me with basic maths in primary school. If you read Barbara Arrowsmith-Young’s book, ‘The Woman Who Changed Her Brain’, you will have a good perspective on the importance of learning the analog clock. Perhaps it won’t be as much for the sake of telling the time this way, but the learning that occurs to develop the brain. Thanks for your comment. I will take a look at the book. It sounds really interesting. I agree, with the exception of using a clock as a graphic tool for understanding time concepts. Not all kids need that approach, but many special needs kids benefit from some form of visual representation. I prefer a number line, myself. Glad I found your blog!